This FM transmitter attaches in series to one of your phone lines. When there is a signal on the line (that is, when you pick up the handset) the circuit will transmit the conversation. In particular it will radiate from the phone line itself. It is a passive device – there is no battery. It uses the signal on the phone line for power. No aerial is needed – it feeds back the RF signal into the phone line which radiates it in the FM band. The frequency of transmission may be adjusted by the trimcap. L1 is 6 turns of enamelled wire, L2 is 8 turns and L3 is 6 turns. Spread out L3 coil about 1 mm apart. The coils should not touch. 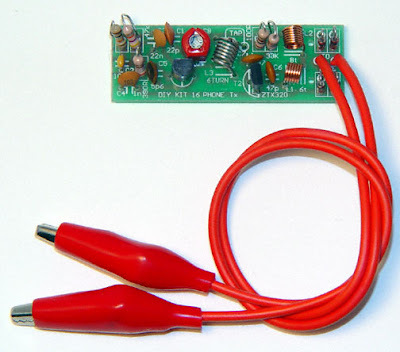 a solder connection (or tap) is required from the top of the first turn in the L3 coil to the pad next to the coil. Solder a piece of wire to the top of the first turn as shown on the overlay. Then solder the other end to the pad immediately next to the L3 coil. R1 & C4 act as a low pass filter. C3 is a high frequency shunt. 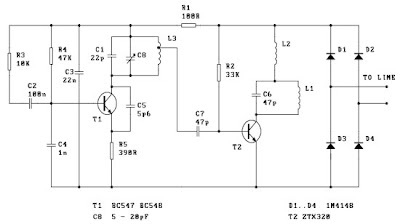 L2 is a RFC (radio frequency shunt.) It decouples the power and audio from the transmitter amplifier circuit. L1 and C6 should be adjusted to match a frequency on your FM receiver. With C1 at 27p you will find that the kit tunes into the FM band in the 86 – 95 MHz area. With C1 at 22p the band is raised to about 90-95mhz (depending in the coil spacing.) If you want to move this tunable area still higher to over 100MHz range then replace C1 by a 15pF or 10pF capacitor. You can experiment to get greater transmission range away from the phone line by adding an aerial (about 150 cm of 26 gauge wire) to the collector of T2.